Colton Dixon performs "Piano Man" from the Billy Joel songbook. DeAndre Brackensick, "Only the Good Die Young": Am seriously starting to believe that DeAndre should have waited a couple of years before trying "American Idol" again. He's too nervous, too shy, and way too naive. He had no clue how to perform this song, and it was all hair-tossing again and looking bewildered. Love his potential, but not sure it will be realized here. Erika Van Pelt, "New York State of Mind": I don't understand how no matter what they do to this 20-something girl, she comes off matronly. Give her a Pink-esque haircut and viewers online were calling it "Liza Minnelli." And as often as Erika talks about her rocker side, she took a ballad and turned it into a piano bar number. Ugh. Nice voice, but just not feelin' it. Read more: Does "American Idol" still need Simon Cowell? 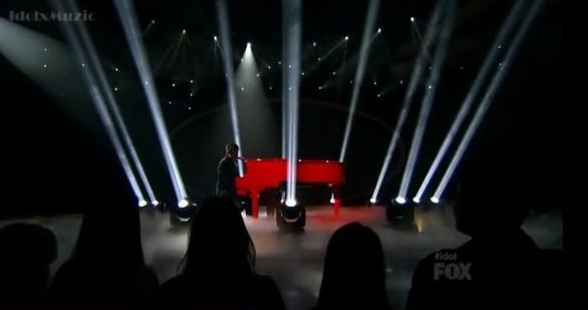 Joshua Ledet, "She's Got a Way": Speaking of not feelin' it, Joshua was obviously not into this song or the mentors' advice to tone down the screaming. While he began with some restraint, just when I was about to be ready to compliment his performance, he brought out a gospel choir and ramped this sweet, tender song up to 11. "STOP!" I screamed at the TV, but he just went on. Just a guess, but I'm getting the impression that if "American Idol" wants Joshua to really feel the lyrics, they need to stop giving him songs about women. Skylar Laine, "Shameless": I loved Skylar's early performances on "American Idol," and was excited about a country singer I actually wanted to listen to. But the last couple of weeks, no matter what the mentors tell her, she keeps oversinging. The uniqueness and sweet tone of her voice get lost in a wail, and it could seriously cost her votes. Elise Testone, "Vienna": I like that Elise stuck to her guns and did a lesser-known song because it was totally the right tune for her. Her smoky vocals came closest to paying tribute to the awesomeness of Billy Joel, and while she did slip a few wonky notes in, I like the unusual little acrobatic interludes she tosses in, particularly the ending run that had me feeling all burlesque-y and "Moulin Rouge"-y for some reason. Good stuff, and hopefully launches her out of the dreaded bottom 3. Phillip Phillips, "Movin' Out": I felt like Phil was nearing Casey Abrams-schtick territory with this one. The strange facial expressions were more on display here, it was a little screamy, and he killed Joel's melody dead. David Cook was a master at preserving melody while attacking it from a different direction, and Phil hasn't reached those heights for me yet. Hollie Cavanagh, "Honesty": I'm still not clear on how putting Hollie in a pantsuit and overdone make-up was supposed to make her look younger. Seriously, put this girl in a ponytail and a print dress and let her be the adorable sprite she is. I thought the judges were a bit harsh on Hollie, because she did better conveying the meaning of the song than several of the other contestants, even if she did have a few clunky notes here and there. Heejun Han, "My Life": It's rare to see Steven Tyler look P.O. 'd on "American Idol," but he definitely was after this comedy of a performance. "Did you feel good taking the piss out of that song?" Steven asked, absolutely nailing the critique. It seemed clear that Heejun wasn't a fan of the criticism he got last week and so decided to just make fun of the whole thing. Maybe that's what he's been doing from the start. But everything from his childish wardrobe to his pretend "false start" to his mocking tone on the lyrics was an insult to the contestants taking the show seriously, even moreso because one of them will probably go home in his place tomorrow night. 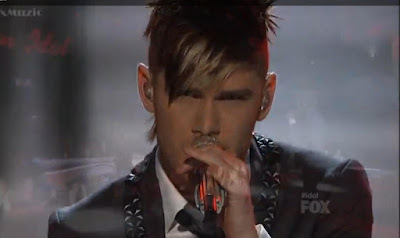 Read more: Will Former 'American Idol' Reject Colton Dixon Make it on Season 11? Jessica Sanchez, "Everybody Has a Dream": Though I'm no longer the fan I was back in Hollywood, I do still admire Jessica's voice and I did enjoy some of the verve she showed on this song once she warmed up to it. The Mariah Carey-like punctuated high notes near the end were my favorite, and it was a pretty good pop diva moment for her. Colton Dixon, "Piano Man": The piano playing and soft verses were sublime on this piece, and I still love that little plaintive wail he's got when he goes up for the bigger notes. To be fair to his critics, he may have overused the break a bit too much here--or it just happened naturally from pushing a bit too much on the chorus. However, I'm willing to endure a few flaws in order to enjoy the emotion in his voice, and the different textures of tone he offers in each performance. And the red piano and floodlights were awesome. What do you think, "American Idol" fans? Who were your favorites tonight? Will we finally have some guys in the Bottom 3, as it should be, or will Heejun laugh his way to the safe stools? PHOTO: "American Idol" Top 10 screencrap, c2012, FOX.